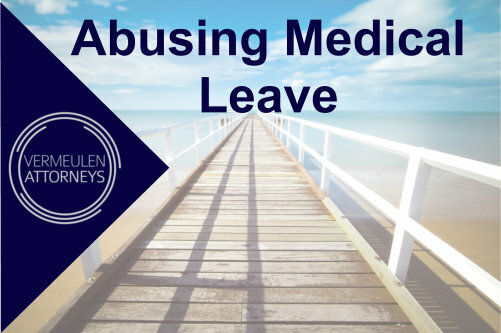 WHAT CAN AN EMPLOYER DO WHEN AN EMPLOYEE IS ABUSING HIS MEDICAL LEAVE? It happens too often that an employer is faced with an employee who takes more medical leave than he is supposed texpected, but the employee always provides a medical certificate. The question usually arises, whether the employer must just sit back and accept the sick note from the doctor or whether the employer can challenge the medical certificate. This question will be answered in this article. An employer usually accepts that when an employee provides a medical certificate it is valid. When a certain employee starts taking more sick leave and keeps providing a medical certificate, the question is always asked whether the employer is bound by the medical certificate and whether the employer can do anything. The simple answer is no. An employer does not merely have to accept the medical certificate and has the right to enquire with the employee and the medical practitioner whether the medical certificate is valid. In the judgment of Mgobhozi v Naidoo NO & Others  3 BLLR 242 (LAC) the court held that a medical certificate constitutes hearsay evidence. This means that, an employer has the right to query any medical certificate provided to him. The employer can further contact the medical practitioner and enquire whether the employee indeed attended his offices and whether the medical practitioner indeed wrote out the medical certificate on behalf of the employee. The employer can further request that the medical practitioner provide him with further proof such as documents, blood tests, notes etc. to substantiate the medical certificate. In terms of the BCEA an employee is entitled to sick leave, the BCEA deals with medical certificates and the validity thereof. From the above, it is clear that the medical certificate has to be signed by a medical practitioner, or any other person who is certified to diagnose and treat patients. It is further clear that the medical practitioner should be of the conviction that the employee was unfit for work on the dates stated. In the event that an employee does not provide the employer with a valid medical certificate, the employee may withhold payment. When an employee presents a medical certificate to an employer, the employer does not have to accept it, if the employer feels that the medical certificate is not valid. A medical certificate is hearsay and therefore the employer can query the illness of the employee.